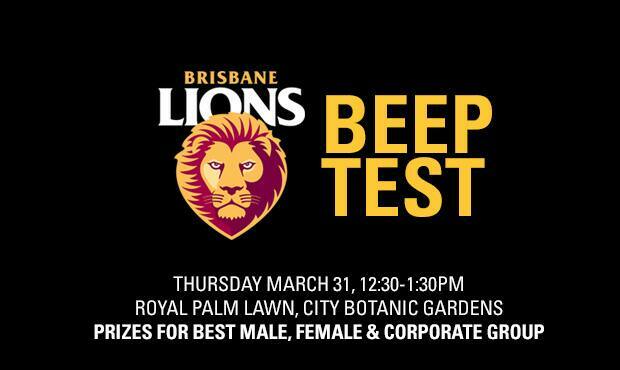 The Lions are giving the people of Brisbane the chance to burn off the guilt of too many Easter eggs (or Lions donuts) with the introduction of the Brisbane Lions beep test this Thursday. The Brisbane Lions Beep Test will give fans and fitness fanatics the opportunity to test their fitness levels on the iconic AFL endurance drill while Lions players cheer you on. The Beep Test is part of the ‘Lions Takeover Brisbane’ week in the lead-up to our first home game of the 2016 Premiership Season against North Melbourne this Saturday April 2 at 3.35pm. Prizes are up for grabs for the top finishing male and female – and the best performing group of 5 or more people will win themselves access to the ‘Beep Suite’: an exclusive corporate suite available at a Lions game this year. Club legend Simon Black is famed for his Beep Test efforts, notching a Level 16.1 during his playing career. His record isn’t the best in Lions history though. That accolade belongs to Brad Daziell who set a 16.4 in 2011. All fitness level are welcome at the Lions event this Thursday though. See you there!